Like many venture capitalists, founders, or those who’ve worked for rocket ship technology brands, I’m frequently invited to “grab a coffee”, aka career advice. During the last decade I’ve seen the astonishing growth from the inside at Uber, Dropbox and WhatsApp from the sidelines. Since returning to Europe and joining the venture capital firm Balderton Capital as General Partner I’ve worked with the Career Centre at London Business School helping students looking for guidance about which direction to go in. A large number of those who I speak to don’t really know what they’re good at yet. They can be studying anything from computer science to literature, maths to marketing, economics to languages, and they don’t know where to turn next. For what it’s worth, here’s the approach I recommend — assuming you need to pay the bills and you’re motivated by technology. 2. You have two Olympic Games cycles to establish yourself. That’s eight years. Two tours of duty to find out what you can really excel at, and how you’ll carve out the rest of your career and savings. Yes, there are some great Olympians — Michael Phelps (23 Gold Medals across four consecutive Olympics), Carl Lewis (nine Golds at four) and Usain Bolt (8 Golds at three) — who get more than the eight years allotted to the rest of us. But they are the exceptions — the ones who were going to build the next Google or Amazon no matter what. 4. Reach for a spreadsheet. Start an Excel sheet. Across the x-axis, write your goals and values: the things that matter to you about the world of work and the sort of company you’d want to join. In the first column, write ‘Geo’ for geography: where you want to work. Next, pick the top three relevant venture capital (VC) firms in that Geo and list them on the left column, starting from the top left, going downwards. Then continue with your goals and values across the top row. For example, you could think about industry/sector, number of employees, company culture, brand power, the financial stage they are at. Revenues, co-investors, salary, stock options. And so on — until you have an empty shell of an Excel sheet. 5. Do your due diligence. 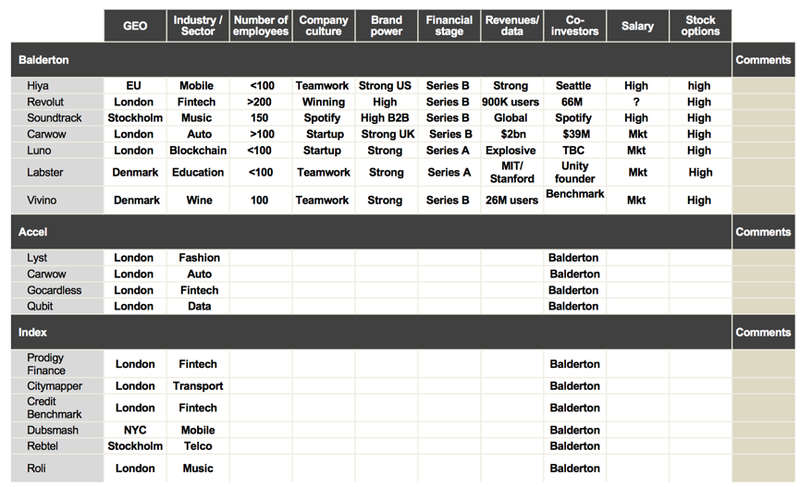 For each of the VCs, scour their website, look through their portfolio companies (here is Balderton’s) and start to write down those start-ups that stand out to you, in an industry or area you think is interesting. At the end of this process, you’ll have a list of 20–40 companies. For each company, go across the goals and values that you wrote across the top row and complete the list for each company. Use LinkedIn, Crunchbase and Pitchbook if you have access and general internet searches to get the information you need. For the financial stage, look at media coverage and related press releases. You’ll also need to track down when the company you’re researching last raised capital and which stage it was. If, for example, it’s a Series A company, which raised two years ago, and you continue to read positive press about them, the chances are they are probably about to raise their next round. And just before they do so is a very good time to join. 6. You now have a spreadsheet that captures both all of the various aspirations and factors which are important to you and the most significant VCs — who act as a filter for their portfolio companies and allow you to determine which of them are potentially a great fit. So you now have a number of target companies and among them — hopefully — is your next rocket ship. 7. If the first objective with this process is to come up with a shortlist of potential employers, the second is to get that initial meeting. Don’t go through HR (or any of the other methods I list above in #3). It’s always better to go through personal contacts — it’s human nature that a mutual contact or even a second-degree introduction will always be warmer than a cold application. Once you’re in front of your contact at your target company, with your preparation done, get ready to run the race of your life. Prepare for the meeting as if you already have the job. Look at who you know in each of your target companies — again, using LinkedIn. Let’s take Revolut as an example. Type in the company name and see if you have any 1st-degree connections or failing that 2nd-degree connections there (if not, find a mutual acquaintance to introduce you). Depending on your skillset, look at what role you would ideally do at that company. Are you a coder? Are you in data analyst? Or sales and marketing? Tailor accordingly as you prepare a set of slides (but don’t go overboard; a few will suffice) — explaining what you would do if you were in that position, in that particular company. You’re gearing up for a meeting rather than a formal job interview but, I can assure you, this is of equal — if not greater — importance. We pay close attention to many things in life — we use models and numbers to help with many decisions we have to make. Yet despite this, far too many of us apply opportunistically for potentially life-changing jobs without doing our homework thoroughly first. 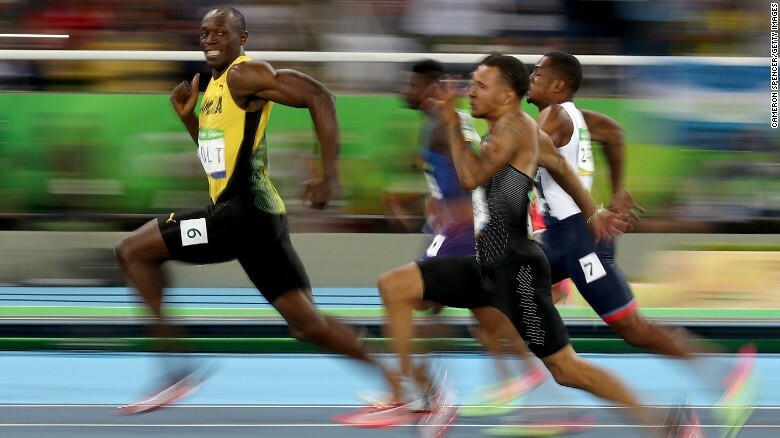 An early career misstep or false start can set off your rocket ship in the wrong direction. But get it right, and suddenly a pathway opens up ahead of you.